Kindrie Grove Studios: Inspiring Art! Kindrie Grove Studios is a working studio, a classroom for workshops and courses and an creative gathering space. 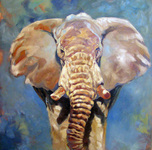 Come in and see Kindrie's latest paintings and sculpture.